We handcast each bag tag using our lead-free pewter formula. Our tags will add a look of class to your luggage. Each one is finely finished by hand to a satin lustre. 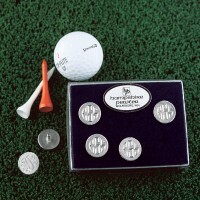 Identify your golf, tennis, or ski bag with our up scale pewter tags. Like our luggage tags, we use our lead-free pewter formula to create these special identifying tags. Every bag tag can be engraved. You can add name, address, and phone information to the luggage tag or you can the name of your favorite golfer, skier, or tennis player to the appropriate tag.